The United States Army is gearing up to destroy an armored Mack dump truck. That’s right. The Army is making plans to obliterate one from its arsenal. This doesn’t seem like a great idea until you understand the destruction is part of a $296 million contract with Mack Defense to build armored dump trucks for the Army. As a preliminary test, the Army will do everything it can to destroy the first of these trucks. The goal is to attack it with a barrage of machine gun fire and, ultimately, blow the vehicle up. Bottom line, the Army is essentially going to war on one of its own trucks. Mack Defense and the Army will use the data gleaned from the experiment in order to build a better dump truck. After all, riders inside the truck will need the ability to survive a large-scale blast in a war-time environment. 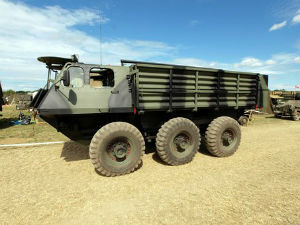 This proposed truck will endure the Army’s intensive 40-week testing process. This trial and error period will take place over the summer at its Aberdeen, Maryland, test facility. It’s not exactly summer camp for the truck which will experience live fire situations. At the end of the day, the goal of the testing is to produce a tough, dependable truck that can withstand the rigors of combat. When testing is complete and trucks are ready for the battlefield, they will be used to carry humanitarian aid, repair supply routes, and any number of other military uses. First priority is ensuring the trucks can operate effectively in dangerous conditions. Additionally, they need to be off-road capable so they can absorb any difficult terrain. These aren’t the only requirements. The trucks need to be able to haul a 22.5-ton payload. The kind of items they may carry include sand and giant boulders. The trucks are now designed with heavy-duty rear axles and are adjusted to allow for higher ground clearance. Currently, the contract with the Army stipulates that 42 modified Mack Granite Trucks be provided. So what do you guys think? Would you like to destroy a truck?